Automation Service and Support - AccuBilt, Inc.
AccuBilt is an employee owned company dedicated to providing the highest level of service and support to our customers. Our skilled team of experienced engineers and technicians offers a complete solution to your automation needs. 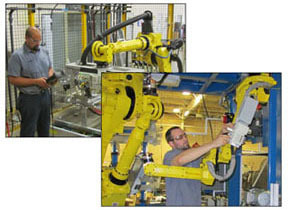 We can troubleshoot and solve your complex automation issues. In addition to building and integrating turn-key automated systems, AccuBilt offers robotic service, repair, programming, technical training and more.